Undisputedly, Serena Williams adores the spotlight and Wimbledon is the Oscars of the tennis stage. In the finals at the All England Club, defending champion Williams overpowered Vera Zvonareva, the 21st seed, 6-3,6-2 to win her fourth Wimbledon trophy and her thirteenth major overall surpassing the great Billie Jean King. Zvonareva was making her debut in the finals at a major and Williams did not rely on first timer jitters to knock out her opponent. In 2004, an intrepid teenage newcomer seeded 13th, Maria Sharapova stunned world number one Williams to take the Wimbledon title. From the very first game, Serena demonstrated that she had learned her lesson. With a backhand down the line winner, Williams held at love to open the match. Showing no nervousness, Zvonareva carried her first game easily. Despite throwing in two double faults and being pushed to deuce the next couple of games, Serena guarded serve to stay ahead 3-2. When Zvonareva’s forehand up the line landed out of play, Williams had her first break point. However, Zvonareva forced the miscues from Serena to level the set at 3 a piece. After Serena had no trouble guarding serve, Zvonareva double faulted on game point for deuce. With a nice lob, Serena obtained another mistake from Zvonareva for her second break point of the game. With an incredible running forehand up the line winner, Serena broke for 5-3. Then, on her third set point, Serena caused Zvonareva to flub another forehand to pocket the set. Under pressure, Zvonareva’s troubles multiplied in the second set. 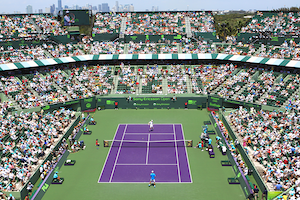 By dumping a backhand crosscourt into the net, Serena earned a break point the first game. When Zvonareva’s forehand missed its destination, Serena took the initial game. Subsequently, with a backhand volley winner, Serena consolidated for a 2-0 edge. From that point on, Serena never removed her foot from the accelerator. With another smoking running forehand, Serena provoked a forehand miscue from Zvonareva for double break point in the fifth game. Although Zvonareva saved those two, she sent another forehand into the net giving Serena a third chance. This time Williams did not have to strike the ball, by double faulting, Zvonareva gifted her a 4-1 lead. The remainder of the match, Serena surrendered just one point on her serve and with a love game to capture the championship. After the match, Zvonareva had nothing but praise for her rival “you’re a great player and a great champion … you’ve shown great determination throughout the week”. The Russian conceded “I’m a little disappointed . . . [but] Serena did not allow me to show my best”. Zvonareva could not manufacture one break point. Williams connected on 66% of her first serves and won 94% of those points. In addition, Serena did not loose a set on as she claimed the title. Since the pain is still fresh, Zvonareva said it’s hard to see the positives. But the Russian admitted that when she reflects in a couple of hours, she will have a better perspective. After all, “I’ve been dreaming of playing Wimbledon since I was a kid”. Considering the hardship that Zvonareva has gone through the last year with her ankle injury, “I was doubting that I was going to ever play”. Zvonareva expressed her gratitude to the people who have stuck by her and aided her to arrive at this moment including her surgeon who was present. Indeed, for Zvonareva, there’s a ton to be proud of. Defending champion Serena Williams’ proclivity to win the Australian Open in uneven years is well documented. Regrettably for Justine Henin, Serena decided not to stick to tradition in 2010. In the final, Serena blocked Justine 6-4, 3-6, 6-2 to claim her fifth Australian Open trophy. Serena was under the gun from the first game. Williams dumped a forehand into the net to give Henin double break point. But, as she has done over and over this fortnight, with good serves, Serena salvaged a four deuce game. After holding serve, helped by the net, Henin earned another break point with a backhand return winner. Again, Serena erased the deficit with an ace. Supreme at saving break points, Serena captured this five deuce game with an overhead winner for 2-1. Subsequently, aided by a Henin double fault, Serena set up triple break point with a backhand crosscourt winner. Williams capitalized when Henin’s forehand went wide. However, due to a rash of errors Williams faced double break point. After saving one with an ace, Serena got a break when a backhand volley winner by Justine was mistakenly judged long; the point was replayed. On the do-over, Serena consolidated for 4-1. Later, Serena handed Justine two chances to get back on serve with a series of miscues. With a forehand crosscourt winner, Justine did just that and went on to equalize the set at 4 all. Yet, after Serena captured her game at love, Justine donated a couple of set points with a double fault and backhand error. When Henin’s backhand skinned the net and landed long, Williams secured the first set. In the second set, Henin and Williams traded roles. The second game, Justine came up with a couple of great serves to obliterate double break point. Afterwards, with a backhand winner, Justine broke Serena at love for a 2-1 edge. Still, the very next game, Henin allowed Williams to level the set. At 2-3, after dismissing another break point, Henin reached a great drop and flicked a forehand volley crosscourt winner for advantage point. When Serena netted another forehand, the set was equalized at 3. Energized, the next game, Henin manufactured a second break opportunity with a backhand volley winner and converted when Williams’ backhand traveled long. After Henin consolidated with a love game for 5-3; she broke Serena at love to capture the set. In the decisive set, Henin opened with a love hold. Then, when Serena’s attempt at serve and volley failed, Henin had double break point. Once again, Serena bombed a couple of aces to shovel herself out for 1 all. Subsequently, as Justine’s forehand up the line sailed long, Serena arrived at double break point. With a sinking backhand stroke, Serena caused Justine to push the backhand volley into the net, thereby obtaining the break for 2-1. But, with three consecutive forehand errors by Williams, Henin was at triple break point. When Henin crushed a forehand return crosscourt, the set was equalized. Still, with another double fault by Henin and a backhand up the line winner, Serena got another break opportunity. Serena cashed in when Justine bungled an easy backhand crosscourt. Despite pressure from her rival, Serena stretched her lead to 4-2 with a second serve ace. Then, with a dipping backhand, Serena forced Henin into a backhand volley mistake leading to two break opportunities. When Henin’s backhand floated long, Williams took a commanding 5-2 edge. Serena sealed the championship with backhand crosscourt winner. As a former world number one, hopes were high that Henin would do well upon rejoining the tour. Nevertheless, the final of her first two tournaments including a major, even for Henin, that is tantamount to a dream. Just four weeks after returning, Henin will be ranked in the top 40. 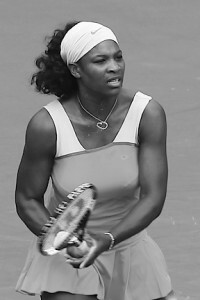 In the quarterfinals against Victoria Azarenka, Serena had perhaps the comeback of her career. After being ahead 6-4, 4-0, Azarenka who played spectacularly from start to finish came out on the losing end. This was the hint that this would be yet again Serena’s year. Serena becomes the first woman since Jennifer Capriati in 2002 to successfully defend. Williams also ties Billy Jean King with 12 majors.